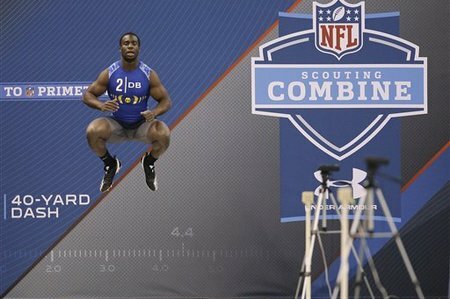 The NFL scouting combine is here, and when you try to imagine the kind of degenerate football addict who would devote precious weekend hours to watching football players run, jump and lift weights while a team of announcers fill air time by analyzing everything from a player’s college stats to his hand size… well, just picture me. And even though my inner track fan did backflips at the news that University of Florida speed burner Jeff Demps was ditching the NFL to focus on becoming an Olympic sprinter, the football fiend in my was disappointed that I’d never see Demps toe the line at Lucas Oil Stadium and destroy the combine’s 40-yard dash record. Sad, I know, but the fact that the NFL Network airs devotes more hours to combine coverage every February tells me I’m not alone. Nor am I the only guy who watches the combine while battling the nagging feeling that many of the tests in which coaches and fans place so much importance tell us next to nothing about a player’s ability to transition from the college game to the NFL. This isn’t to say measurables don’t matter. And you can miss me with the “a stopwatch can’t measure how bad a kid wants to make it” speech. All other things being equal, coaches need to figure out who’s the quickest, strongest or fastest so, yes, strength and speed stats do matter. The question is whether the tests players undergo at the combine measure attributes they’ll need on the field, or if they simply gauge the ability to prep for a test. Any player or trainer can tell you the gap between combine shape and game shape is about as wide as the one between Paris Hilton’s ears, and that the most eye-catching tests at the NFL Combine — 40-yard dash, bench press — are probably the least applicable to game situations. So I’m proposing and NFL Combine makeover. I don’t pretend to have the definitive answers, and invite anybody reading this blog to suggest further improvements and weigh in with their own proposed changes. But here are four adjustments I’d make right away. 1. Add WR-DB 1-on-1 drills. Because they’re a practical application of the footwork and ball drills skill position players perform. Football purists cringe when they see receivers and tight ends run the Gauntlet, snagging passes and quickly discarding the ball to prepare for the next pass, never bothering to tuck the ball away. In a one-on-one ball security matters. I understand these drills are set up for receivers to succeed — without formations and down-and-distance a DB doesn’t have the cues he needs to figure out what route might be coming. And the absence of a pass rush almost guarantees the quarterback in the drill delivers the ball on time and on target. If he can’t, he probably doesn’t belong in the NFL. And if a DB makes plays despite the odds arrayed against him he might just be a player. Because a one-off 40 is to functional speed what a first date is to relationships. It’s a player’s representative — and one who embellishes important details to seem more appealing to a prospective partner but who can’t maintain that facade forever. So instead of testing speed in isolation then hoping players can blaze in games, why not tweak the test? I’m thinking a series of four 40s, all out each time, with a minute rest between each sprint. Then rest five or so minutes and do it again, because that’s how it goes in a game. You sprint and recover and sprint and recover, then head to the bench on a change of possession. I’d time each run electronically because, as we’ve established, hand-timed 40-yard dashes tell us next to nothing. It’s an exhausting process and a pair of 40s don’t tell you much about how a player will handle it. But a series of 40s with short recovery provide a clearer idea of who can turn on the afterburners in the fourth quarter. First, forcing every player, regardless of size, to lift 225 pounds makes as much sense as giving them all the same size cleats or shoulder pads. One size doesn’t fit all. Not in clothing, and not in strength tests. Second, if a player can rep out 225 pounds 25, 30, or 40 times he’s showing his endurance, not his strength. If you want to test his strength you need to hike the weight. If bench press has to remain a most-reps contest I’d raise the weight significantly. I might leave it at 225 for DBs and receivers, but bump it to at least 275 for linebackers and running backs. How heavy is too heavy? 315? 335? 350? I can’t say for sure. I just know that if you’re banging out 30-plus reps with 225, it’s way too light. 4. Add one World’s Strongest Man-type lift to the mix. Because, more than anything, a football player needs functional, total body strength — something bench pressing doesn’t develop or measure. Blocking and tackling don’t require the single-plane strength a bench press does. They demand the strength that comes from wrestling with odd-shaped objects that don’t always move in the direction you want them to. Or maybe flipping cars over. Or the one the world’s fittest reporter tried recently — the prowler push. Point here is that if NFL teams are going to make multimillion-dollar decisions based on combine results, they need results that speak more directly to what they want to know. How the player will perform on the field. These are my suggestions, but I’m open to hearing yours. Follow Morgan Campbell on Twitter. Terrence Austin’s body language is unbelievable. Had me believing he was running the fly on his comebacks. I’m stealing that move! I hate trying to run the comeback when the db is in trail position.